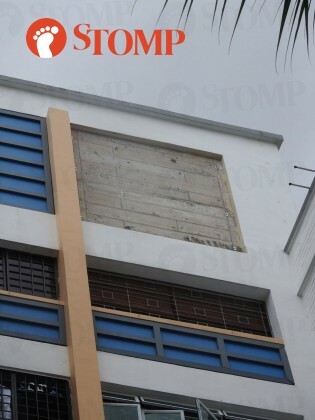 A portion of a decorative facade cladding at Block 270 Pasir Ris Street 21 fell off on Monday afternoon (June 18). The photos show metal beams and debris on the ground floor. Stomp was alerted to the incident and went down to the site at 4.15pm. A worker was seen clearing away the debris. Other photos of the incident were also uploaded on Fabrications About The PAP's Facebook page. According to Mr Zainal, there were no reported injuries. The authorities, including the police, Pasir Ris Town Council and staff from the HDB technical department were present at the scene. In response to a Stomp query, a spokesman for the Pasir Ris - Punggol Town Council said: "Pasir Ris - Punggol Town Council and HDB were informed at about 12pm on June 18, 2018 that a piece of decorative cladding had dislodged from the façade of Block 270 Pasir Ris Street 21. "The panel is part of the façade design and is non-structural. The building is structurally safe. "Pasir Ris-Punggol Town Council will be carrying out the necessary repairs. The Town Council will also take additional precautionary safety measures by checking the neighbouring blocks with similar façade features. "The Town Council has cleared the debris and cordoned off the ground floor area beneath the affected facade."